Fenway Park, along with Wrigley Field, is one of the most classic ballparks in Major League Baseball that is still standing. Located at 4 Yawkey Way in Boston, Fenway Park was opened on April 20, 1912 with a game between the Boston Red Sox and New York Highlanders, later to be known as the New York Yankees. Currently in its 101st year of existence, the ballpark has seen many renovations and additions over the years, given its age and location in the tightly constructed Fenway-Kenmore neighborhood of Boston. This has not stopped Red Sox fans from coming out to root on their team. The ball club has sold out every home game since May 15, 2003. This is easy to do given the stadium in general has the fourth lowest seating capacity in all of baseball with 37,499 seats. 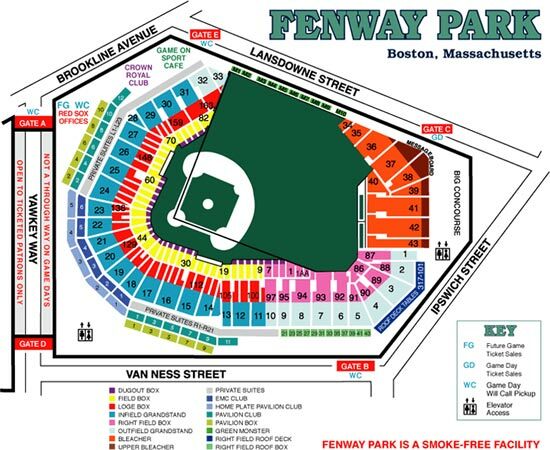 Green Monster – The left field wall (see hero image of this post) of the ballpark stands at over 37-feet high and 315-feet away from home plate, giving right-handed hitters a distinct advantage at the plate. The wall was part of the original construction and features a scoreboard that is manually updated throughout the course of the game. The Lone Red Seat – Section 42, Row 37, Seat 21 to be exact! This red seat memorializes the longest home run ever hit at Fenway. Who did it? Ted Williams of course, back on June 9, 1946, at a distance of 502-feet.